In 1898, Camillo Golgi, an Italian cytologist, discovered that when he treated the cells with silver salts, certain peculiar bodies showed up in the cytoplasm. The Camillo Golgi discovered, in 1898, by a Silver-impregnation method, a reticular structure in the nerve cells of the barn owl, which he called the ‘apparato reticular interno’. 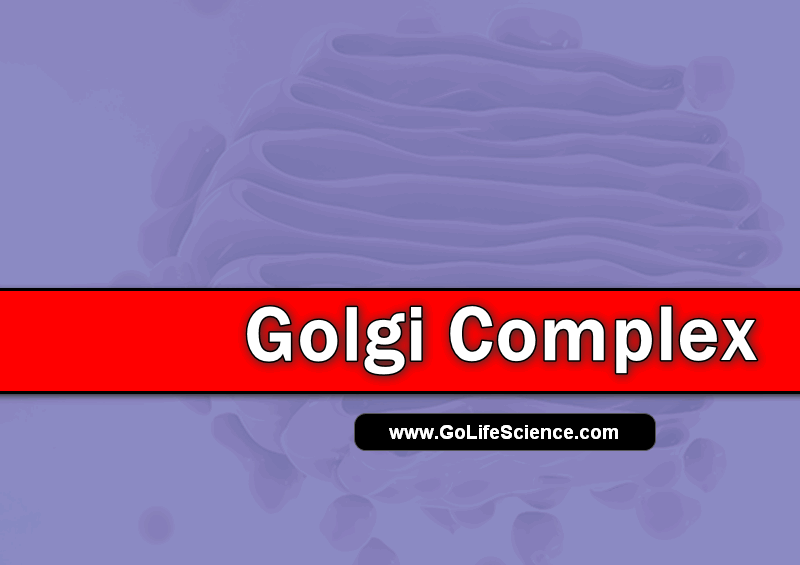 Subsequently, this came to be named as Golgi complex. At this organelle could not be observed in living cells, its existence was disputed and it was considered to be an artifact. The use of electron microscopy provided a distinct picture of this organelle. Cytochemistry also provided the evidence for its reality. By the application of the modern techniques, including autoradiography, the structural organization as well as the role of Golgi apparatus in cellular functions, have been elucidated to a great extent. The “reticular apparatuses” he described had never been noticed before, and they didn’t show up with other stains. But when other workers used Golgi’s silver treatment, they found the bodies in a variety of secretory cells. Because the silver treatment was considered drastic, and because the peculiar bodies were never seen in living cells, cytologists argued for the next 50 years over whether Golgi bodies were really cell structures or just artifacts caused by silver treatment. The membranes of Golgi complex or apparatus is of lipoprotein and care supposed to be originated from the membranes of the endoplasmic reticulum. Golgi complex is derived from the endoplasmic reticulum and that it serves as some sort of packaging center for the cell. Such things as enzymes, proteins, and carbohydrates are collected in these bodies and packaged into closed membranous sacs, called vesicles. Thus they have effectively isolated from the rest the cell. The Golgi apparatus or complex is found in the cytoplasm in almost all kinds of eukaryotic cells. Animal cells usually contain one, plant cells may have as many as several hundred. In granular cells, the Golgi bodies are usually situated close to the nucleus and have according to Grasse (1957), definite polarity. Golgi bodies are also known as Lypochondria. The complex consists of units called Dictyosomes. A dictyosome is formed of stacks of flattened, saucer-shaped cisternae and associated secretory vesicles. In liver, there are 50 dictyosomes per cell, representing about two percent of the total cytoplasmic volume. The Golgi complex is surrounded by a zone from which most ribosomes, glycogen, and mitochondria are absent. In most animal and plant cells, there may be a stack of three to seven cisternae; however, in some algae, there are 10 or 20 cisternae in a stack. 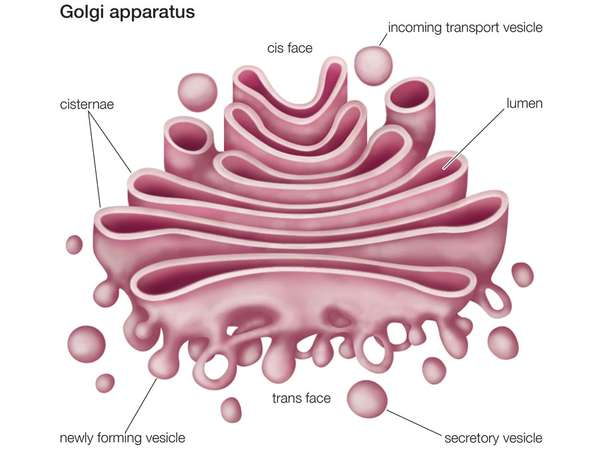 The Golgi apparatus was reported in 1898 by Golgi which consists of a smooth surface membrane structure. It has a system of outer flattened cisternae which appear as roughly parallel membranes enclosing a space 60 to 900 A with a distance of about 200A0 between them. Cisternae and Vesicles are associated with the inner cisternae, particularly glandular cells. In diatoms, the Golgi body gives rise to translucent vesicles which collect beneath the plasmalemma where they fuse to form a Silicalemma in which the siliceous cells wall forms. It plays important role in the synthesis and storage of secreted products like mucopolysaccharides and glycoproteins. It is considered as the source of primary lysosomes membrane-bounded particles containing hydrolytic enzymes. It functions as packing center of the cell. The most important function of the Golgi complex is Glycosylation. It produces Glycophospholipids and Glycoproteins. Simply, it plays a good role in the biosynthesis of Gangliosides and other glycosphingolipids. The Golgi membranes are also involved in the formation of the primary lysosomes. The glycosidation of lysosomal glycosylation enzymes is by the Golgi.